What can be rebuilt out of the old order? Tracey Sinclair reviews Patrick Marber’s take on Strindberg’s “depressingly relevant” play. After Miss Julie at Theatre Royal Brighton. Photo: Nobby Clark. Theatre Royal Bath’s new production of Patrick Marber’s After Miss Julie (based on the Strindberg play) in some ways couldn’t be more timely. It’s set in August 1945, the night of the Labour landslide victory, a period of seismic shifts in a country in upheaval, and asks what can be rebuilt out of the rubble of the old order – even if its conclusions aren’t particularly reassuring. What could be more relevant to our current chaotic climate? But while it’s not without its pleasures, Anthony Banks’ piece never quite convinces. The central trio give solid, if not particularly memorable, performances. There’s a believable chemistry between John and both women, although the near-hysterical pitch of much of his and Miss Julie’s interactions too often undermines their believability. 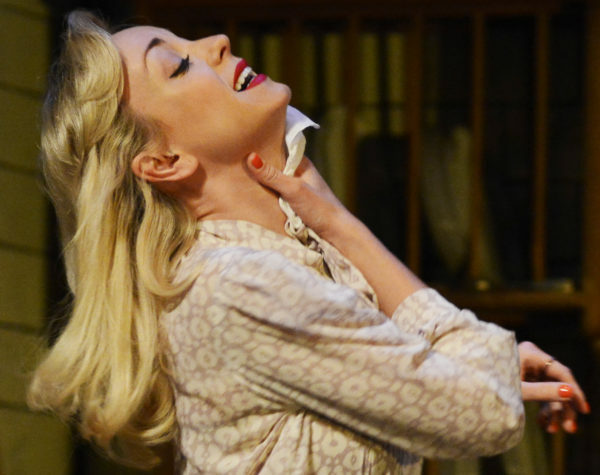 Helen George as Miss Julie is brittle as spun glass, skittish as a thoroughbred racehorse, while Richard Flood’s John is a man conflicted – proud of his self-made education, shaped by the war, but still entrenched in society’s rules. Both have an eye for the other’s weaknesses, and at its best Marber’s script has some acid barbs, his trademark talent for emotional cruelty evident. But too often it gets ramped up so far it loses credibility, genuine emotional truths drowned out by showy theatrics. Amy Cudden captures Christine’s dry-eyed practicality well, but the role is fairly thankless, and her espousing of religion, like so much else in the piece, feels shoe-horned in to make a point rather than an organic part of her character. The production is also undermined by an uneven tone, director Banks never seeming to land on a coherent pitch – there were a few moments when you couldn’t tell what was being played for laughs or not (the audience seemed to find the bird-killing scene unexpectedly hilarious, and introducing a real dog in the opening moments was a mistake, since everyone went ‘ah!’ loudly and you could almost feel them wondering throughout whether the cute puppy would make a reappearance, which rather undermined the psychological drama). There are, however, some nicely judged moments, and it’s in the quieter exchanges that the cast get a chance to shine. When, the morning after, John and Julie are planning their escape to New York, flush with ideas about opening nightclubs and freeing themselves of the class divides of England, it is clear that these are built on John’s preconceptions about Julie’s finances. When she blithely informs him she ‘doesn’t have a bean’, it ricochets around the room like a slap, the gulf between how the rich and the poor think money works, and how easy it is to be oblivious about wealth when your family has a lot of it, laid bare by an almost throwaway line. It’s also a clear eyed and timely look at the myth of genuine social mobility. It’s a recurring theme of Miss Julie’s that New York offers some kind of egalitarian paradise, that the Americans will ‘go crazy’ for British accents, not differentiating between the working class vowels of Christine and John or the cut-glass tones of Miss Julie. But we, and she, know this is a mirage – such reinvention takes cash, and Julie later mocks the very idea of John, with his work-hardened hands, being able to run a nightclub for New York’s monied patrons. These events take place on a night when political and class tides were shifting, boundaries supposedly blurred, drunk on possibility as much as wine. But when everyone wakes up after the party, the old rules remain in place: in the cold, hungover light of day, the rich and entitled still have all the power, the workers are left with scraps and dreams, at mercy of their masters’ whims. In 2016, this still feels depressingly relevant.